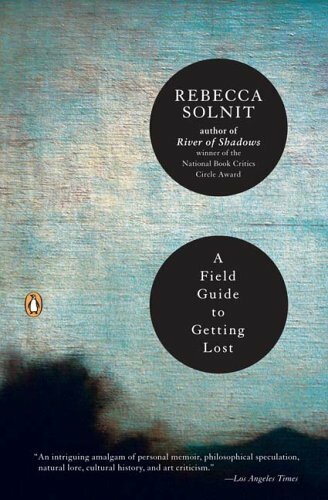 Book Review: A Field Guide to Getting Lost by Rebecca Solnit – Broad! The dark sea is of course blue, a color that Solnit constantly re-evokes because of its connection with distance, with lost things: blue—as in the sky, as in the ocean, as in the faraway—is not real, but an intricate mixture of light and desire. I wondered, after reading this book, about my ability to access the dark blue unknown, to go there and get lost. With my GPS and my cell phone, with email and social media accounts and blogs, with Google tracking all of my website visits and advertisers targeting their online commercials to my preferences, there is no longer the same possibility for being lost: for remaking and renaming oneself; for transformation. It feels crass to bring the buzz of the digital age into conversation with Solnit’s work, which is so deeply engaged with the real and the true of history or nature and never with the cheap, passing fads of popular culture. Still, our post-Enlightenment culture worships science, and with these technologies we all seem to be desperately striving to make the unknown known, to haul in all of the mystery and desire we can find, map it, tag it, and monetize it. I left Facebook for a matter of months and some of my friends behaved as though I had left the world, had gone missing. In the summer during this hiatus a more iconoclastic, nomadic friend passed through town and we met at an arranged time and place because he had discarded his cell phone somewhere between North Carolina and Utah. We found each other but got lost in the park where we walked, forgetting the time along the way. We discussed trust and how leaving digital life is a form of going astray; there comes a doubt, a frustration, from others who would prefer you to be always found. I would like to say that losing a cell phone or an online account is like getting lost in Solnit’s sense, but it is only a taste of that underworld; further transformation cannot take place with so many watching. Much of A Field Guide tells stories of hermitage, of reveling in solitude. Solnit recognized the anxiety we have historically felt about getting lost, about separation from community, about the unknown. But seven years after she published this book, I have to think that anxiety has been amplified with our fixation on digital identities. Recently I recreated my Facebook profile and was instructed many times, in the imperative, to “find friends”. Today Google+ informed me, after I added three Broad! editors to my circle for a virtual meeting, that I “might be lonely!” if I didn’t contact more people. I think if we are anxious about getting lost, with its implications of loneliness and separation, we are now even more fearful of being lost, of not being remembered in an age when every moment can be simultaneously archived forever and forgotten immediately, buried under so much that is happening in the present. But to continue with Solnit’s paradox, I hope A Field Guide to Getting Lost never will be lost or forgotten; it is an increasingly relevant work of literature that promises to endure.